356 pages | 61 B/W Illus. 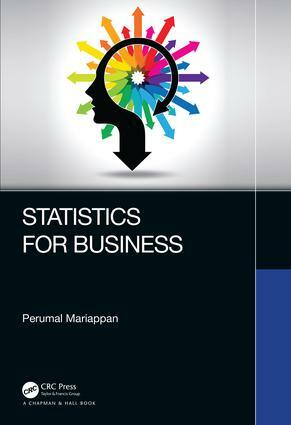 Statistics for Business is meant as a textbook for students in business, computer science, bioengineering, environmental technology, and mathematics. In recent years, business statistics is used widely for decision making in business endeavours. It emphasizes statistical applications, statistical model building, and determining the manual solution methods. This text is prepared based on "self-taught" method. For most of the methods, the required algorithm is clearly explained using flow-charting methodology. More than 200 solved problems provided. More than 175 end-of-chapter exercises with answers are provided. This allows teachers ample flexibility in adopting the textbook to their individual class plans. This textbook is meant to for beginners and advanced learners as a text in Statistics for Business or Applied Statistics for undergraduate and graduate students. Dr. Perumal Mariappan, is currently working as Head of PG Department of Actuarial Science, Bishop Heber College, in Trichy, Tamilnadu, India. He has PhDs in both Management and Mathematics. He has published 37 textbooks and more than hundred research articles in international journals. He has received 10 prestigious awards, is an editorial board member for many reputed international journals, and has visited ten countries.